LOVING and CARING FOR YOUR WOODEN ANTIQUES. There are many misconceptions in the Antique Furniture Industry about caring for and maintaining your much loved furniture treasures. This is my personal opinion on this issue, based upon years of appraising, maintaining, restoring and answering questions on this topic. 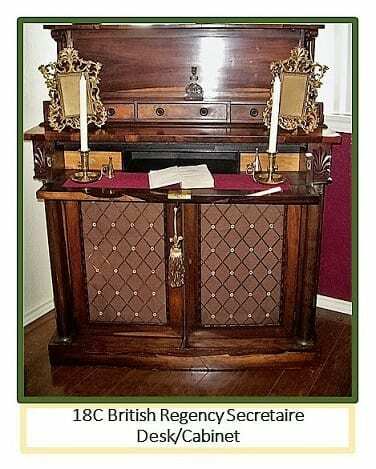 Opinions differ between many experts as to the best way to maintain your antique furniture and this has led to 'inevitable' confusion amongst collectors as to what is the best practice in caring for and maintaining antique furniture. 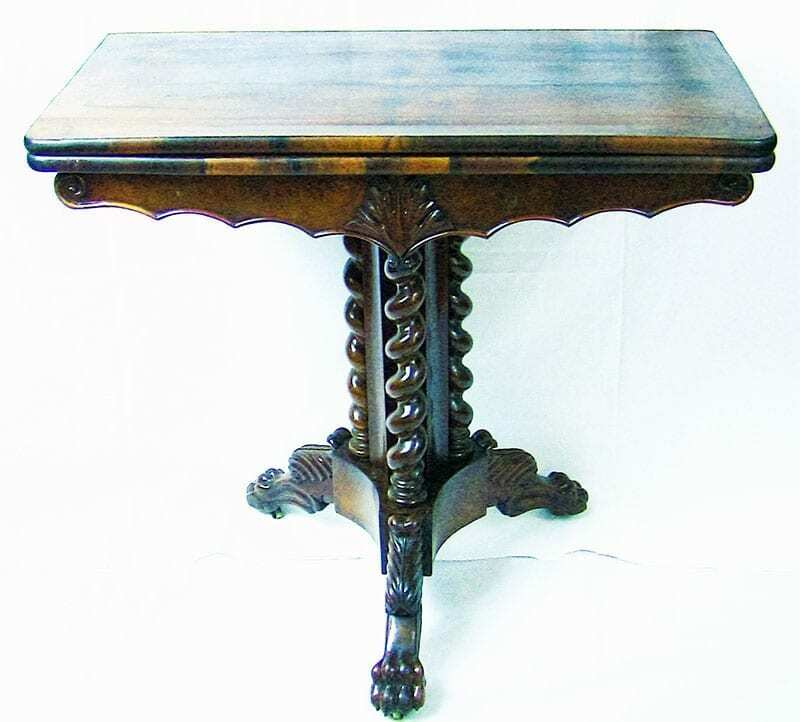 I have heard clients and customers often say "but I saw the expert on Antiques Roadshow and he was complaining about the piece being restored and that they had reduced the piece's value by 'messing' with it" or "I saw on Antiques Roadshow that a lady had cleaned up her table and that the expert loved that some of the original dirt was still on the legs. I think she should have done nothing to the table". I recently had a client who was ‘horrified’ that I recommended that we simply clean and polish or oil her items of furniture. Said items had clearly not been cared for or maintained for a long, long time. They were caked and covered in a thick layer of dust and grime and had suffered water damage through neglect, thereby potentially destroying their original beauty and value. She was one of those people who had seen on TV that restoring furniture is ‘bad’ and not cleaning it was ‘good’. WRONG in both instances. Now, do not get me wrong, original untouched antiques are the most desirable, and the trade is always looking for truly original pieces and as much as is practicable, untouched pieces. But what people need to realize is that there is a 'big' difference between 'maintenance' and 'restoration'. The two should never be confused as they do not amount to the same thing. When we talk about an original, untouched piece, we are not talking about a piece that has ‘literally’ been left untouched by human hands, cloth or polish for dozens or hundreds of years. 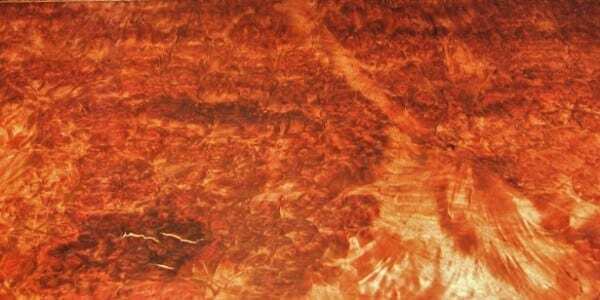 When talking about furniture and in particular, the use of the term ‘patina’, we are talking about the color, finish, wax build-up, natural wear and tear that a piece of wooden furniture acquires over time (hundreds of years in some cases). This natural build-up is NOT as a result of leaving the piece unmaintained over that time. It IS directly as a result of long and regular maintenance of a piece through cleaning, waxing, oiling and buffing over time. This is simple ‘maintenance’ of a piece. We would recommend to all collectors that they REGULARLY maintain their pieces. Do not be afraid to use some good old-fashioned elbow grease in maintaining your furniture. Use oils for unlacquered finishes, especially hardwoods, like oak or walnut. Use beeswax and lightly hand buff all antique furniture on a regular basis. This type of regular maintenance is what causes the development of ‘patina’ in pieces over time. DO NOT ignore your furniture, but DO NOT become obsessive about your cleaning or lack of cleaning. Moving on to ‘Restoration’, in some cases, furniture may have been so badly neglected or damaged that the only option is restoration. 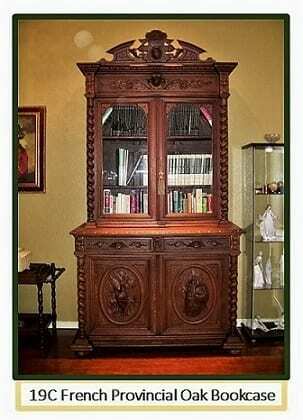 Most reputable and expert restorers will only do what is necessary to restore a piece to its original condition. They are only too aware of the aesthetics of the piece and the effect of over-restoration on its value. TRUST THEM; they know what they are doing! Over-restoration is the main PROBLEM. What all restorers and dealers want, is to avoid any scenario where the piece is completely re-stripped and re-finished. This is the option of last resort but sometimes it is unavoidable. Any dealer or restorer that strips and re-finishes a piece that does not require this work as of necessity is, in my opinion, a ‘charlatan’ and does themselves and their clients no favors. The key is ALWAYS to keep restoration to a minimum. Watermarks from cups or vases need to be dealt with immediately by the owner of a piece. Use one of the many products available on the market to treat these issues as they happen but remember that it is not disastrous to a piece to have some marks or blemishes acquired through use over time. 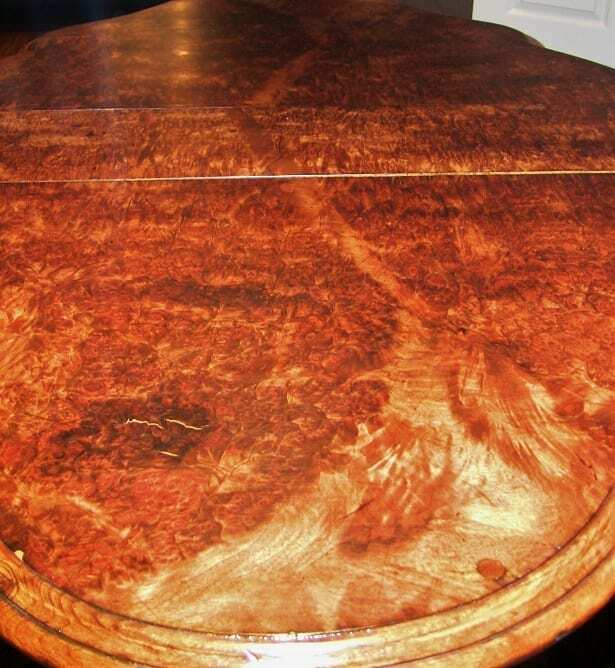 In fact, in most cases, these marks and blemishes only add to the patina and character of an antique piece. Stripping and refinishing a piece because of minor blemishes is a complete “no-no”. If in doubt, simply ask your local reputable dealer or restorer for their advice on what to do! 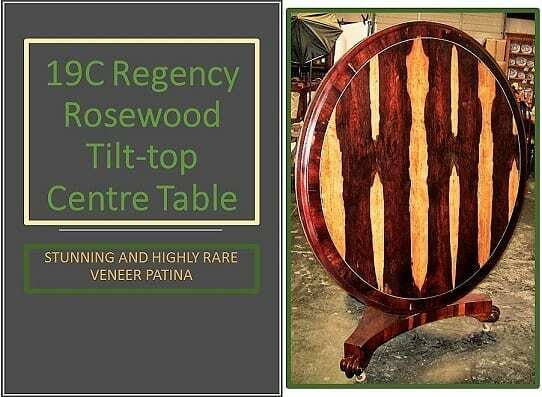 Whilst I am not a ‘fan’ of painting antique furniture, as I consider myself a ‘purist’ when it comes to antique furniture, I can understand trends and fashions and the need to cater to the current market and its wishes and desires. However, I believe that everybody needs to be ‘absolutely certain’ that the piece being painted is a ‘plain’ piece or of little aesthetic value and that it will not be a potential treasure of the future. Remember that trends come and go and painted furniture will ‘have its day’, if not already. But if you paint a valuable piece, you will be destroying its potential value in the future. Why you may ask? Because it will be a piece that will need to be stripped and re-finished in the future and you could possibly be ‘that’ person on Antiques Roadshow explaining why! I hope this brief article helps. WHY SETTLE FOR THE ORDINARY WHEN YOU CAN HAVE THE EXTRAORDINARY …………. BUY YOUR ANTIQUES FROM US TODAY!